This week was our forest school week 9. What a fast 9 weeks and sadly we had some interruption throughout due to weather including this week. But this never stopped us having fun! Unfortunately on Tuesday we had a yellow weather warning of high winds and this does make it very unsafe in a forest. The children have been involved in discussion about why it was too unsafe. We instead found a big field where we could explore and work as a team using the rope. One of our seats blew away and we found it in the big puddle. Children worked together to get it back. The children discussed how we could save it while keeping themselves safe. After lots of problem solving the best way to do this was to get in the puddle with the seat and rescue it with their hands ! Well done! On Wednesday we still had a yellow wind warning in place and the children decided they would play in the park as it was safer than entering the forest. The children worked together and supported each other to use some of the equipment. One of the children then decided to bring forest school to the park and brought out the rope. He asked a member of staff to tie a safe rope on the the climbing frame so he could climb up the side. The children spent all morning working with each other and did not require much staff support. We even forgot to have snack and had to have it when we got back to nursery. Phew our weather warning has gone. Today we returned to our forest for week 9. Our children took off from where they left off. Our dens were built, we explored the slope, made our own and others snack, applied mud make up and balanced along a fallen tree. Busy bees! We got ready super fast and got to the forest in record time. The children enjoyed climbing the fallen trees, making knots with the rope and of course hot chocolate under the canopy. 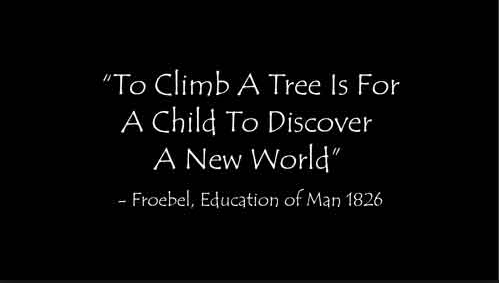 We never underestimate the pleasure and sense of achievement that children and adults feel when they climb a tree and neither did Friedrich Froebel in 1826. Next week its ‘Cook Out’ week. We will be cooking our lunch on the fire and having another chance to play with our friends in the forest.